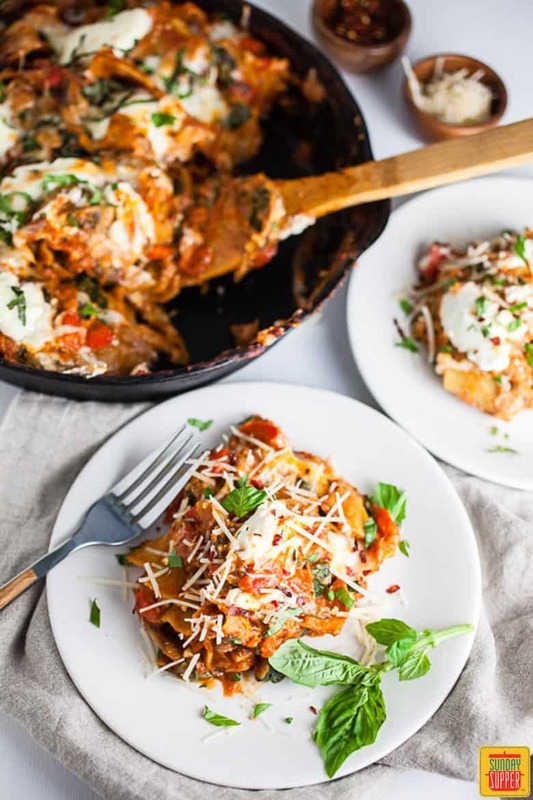 Cast Iron Skillet Lasagna is a one pot wonder your family will LOVE! Easy, cheesy, and vegetarian too. 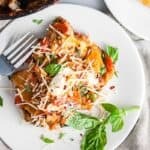 The whole family will enjoy this cheesy dinner idea that’s perfect any night of the week, yet special enough to serve for Sunday Supper too! Gather the family around the table and make memories with this delicious meal! Sometimes I just love a good hearty pasta dish. Especially during months of cold temperatures like the ones we’ve had in Minnesota this winter. A hearty, stick-to-your-ribs meat and potatoes dish is always delicious but I think vegetarian meals can be just as satisfying. 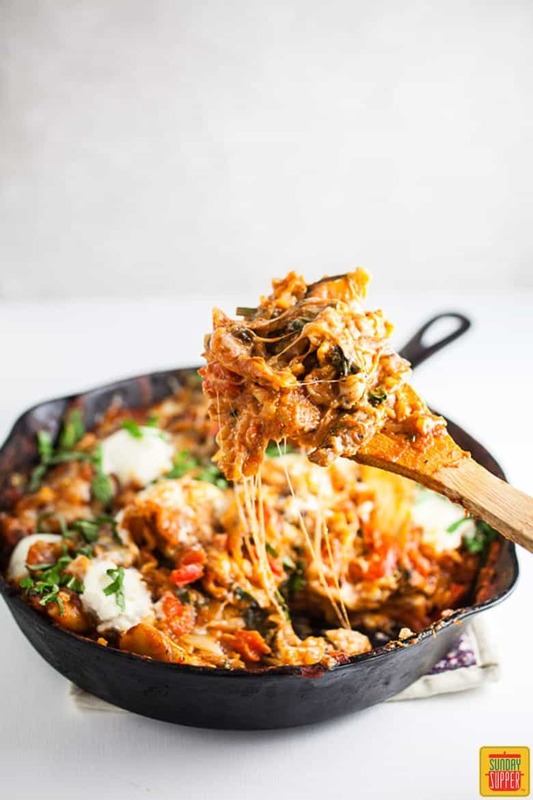 This Cheesy Vegetarian Cast Iron Skillet Lasagna is the perfect dish for a cold night when you just want something comforting. It’s faster and easier to make than a traditional lasagna and, in my opinion, is actually tastier. This cast iron skillet lasagna will feed your family and the whole thing is almost entirely made on the stove top. After making this recipe I wondered where cast iron skillet lasagna had been all my life. It starts out as most great recipes do with plenty of garlic and onions. Simply mince 6 cloves of garlic and 1 onion (can be yellow, white, or red). Dice 1 bell pepper – I prefer red peppers but feel free to use any color pepper you like. Cut 1 8 oz. 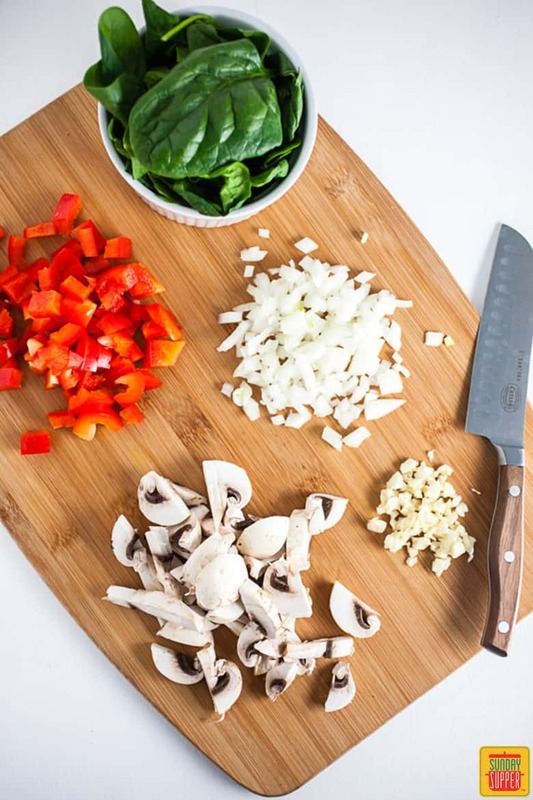 package of button mushrooms into small slices and roughly chop 1 cup of fresh spinach. This whole dish is made in a large cast iron skillet. It’s going to seem like there’s no way that all the ingredients will fit into this one skillet but I assure you they do. Heat the skillet to medium and add 1 Tbsp. of olive oil. Once the oil is heated, add the sliced mushrooms along with a pinch of salt and pepper. Saute the mushrooms for 4-5 minutes, stirring often. The mushrooms will cook down quite a bit. Add the diced peppers and saute for an additional 3-4 minutes, stirring often. Add 1 24 oz. jar of your favorite marinara sauce and 1 1/2 cups of vegetable stock to the skillet. Take 8-10 dried lasagna noodles and break them into pieces into the pan (this is where the pan starts to feel like it will overflow). Stir the noodles into the marinara mixture and make sure all of them are submerged. 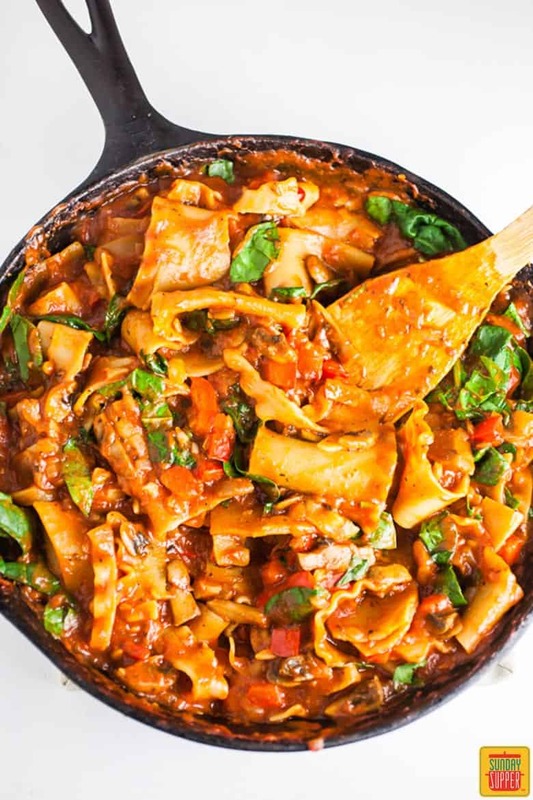 Cooking the noodles directly in the sauce is what gives this skillet lasagna its distinct flavor. Bring the pan to a light boil and simmer on medium/low for 30 minutes. The sauce should lightly bubble as it cooks. Keep the heat low enough so that the sauce doesn’t splatter as it cooks but high enough to cook the noodles. Stir the mixture every 5 minutes (especially as it nears the 30 minute mark) to prevent the noodles from sticking to the bottom. Feel free to add an additional 1/2 cup of vegetable stock to the pan as the noodles cook. The noodles will soak up the liquid and adding additional stock will prevent them from drying out. Try to make sure that the noodles don’t stick together in clumps as they cook because this will prevent them from cooking evenly. All the noodles should be evenly cooked around the 30 minute mark. The lasagna should be saucy but not too liquid-y. At this point add the chopped spinach and stir into the lasagna mixture. I mentioned before that this lasagna is made almost entirely on the stove top. It’s actually finished off under the broiler in the oven. The broiler will brown the cheese and allow it to melt perfectly into the dish. Turn the broiler on and dot the top of the lasagna with 1/2-3/4 cup of ricotta cheese (don’t stir the ricotta into the lasagna). Sprinkle a heaping 1/2 cup of mozzarella on top of the ricotta and place the whole pan in the oven for about 2 minutes directly under the broiler. The ricotta will melt slightly and the mozzarella will brown a little bit. Once the cheese has melted it’s ready to serve! I love to top this lasagna off with a bit of shredded Parmesan cheese (it is cheesy vegetarian lasagna, after all) and a sprinkle of red chili flakes. Freshly chopped basil adds a nice pop of freshness. Simply mince 1/2 cup or so of basil and sprinkle over the dish. 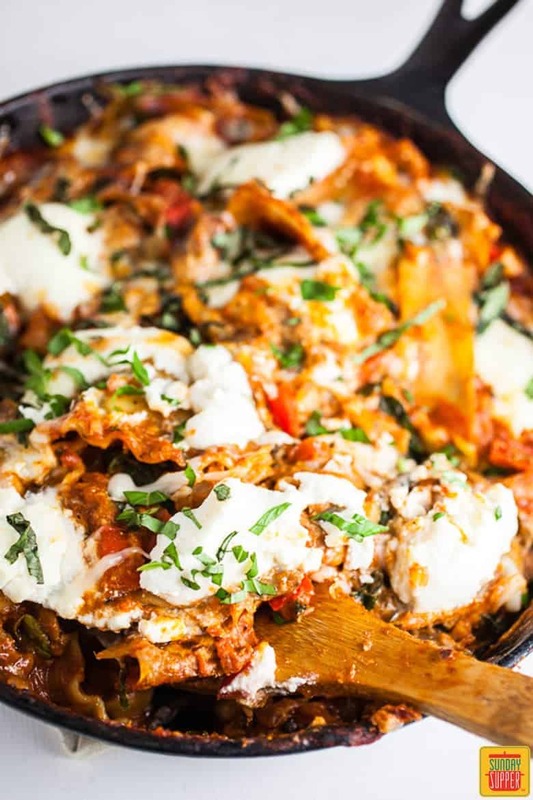 I love how all the flavors complement each other – You’ve got the earthiness of the mushrooms, the sweetness of the marinara sauce, the creaminess of the ricotta, and the spice of the red chili flakes. 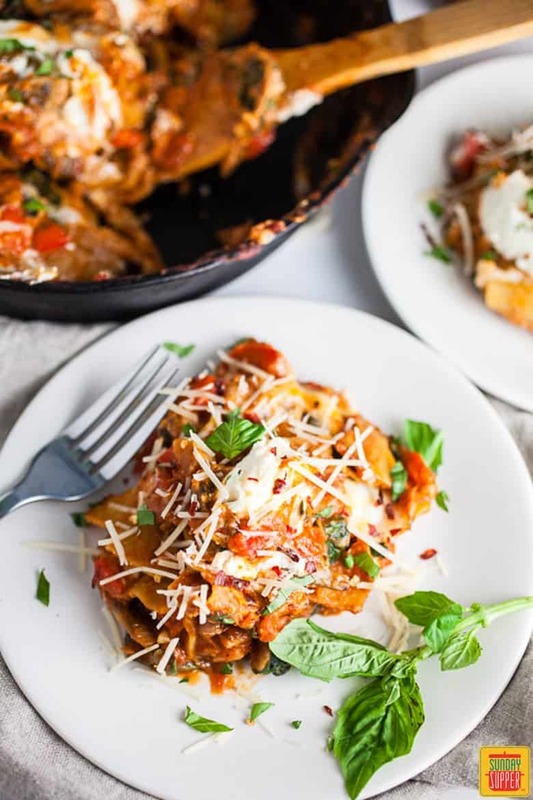 This lasagna will make you look forward to a cozy evening inside (even after a long, cold winter)! 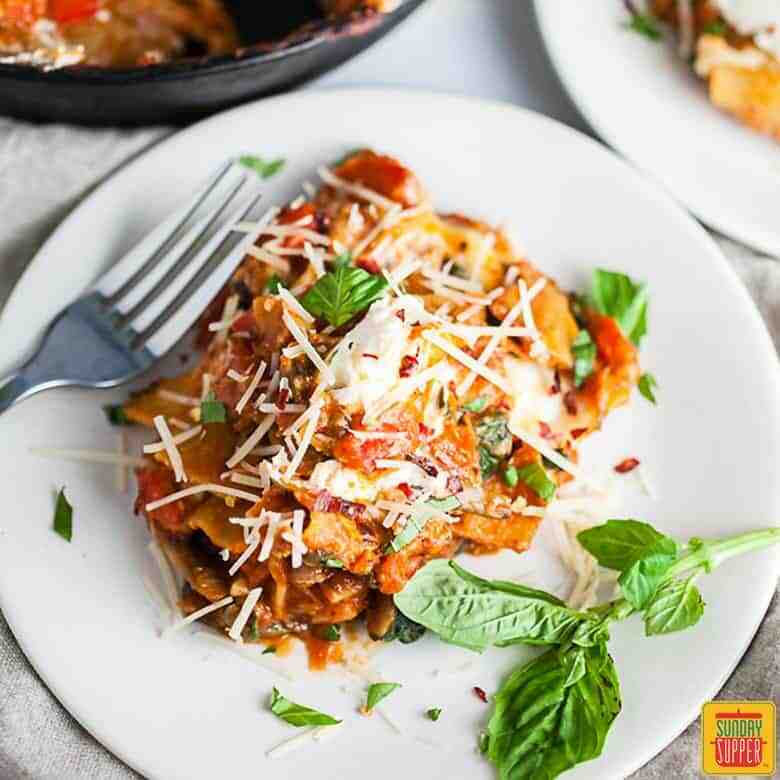 Cast Iron Skillet Lasagna is a one pot wonder your family will LOVE! Easy, cheesy, and vegetarian too. The whole family will love this dinner recipe that's perfect any night of the week, yet special enough to serve for Sunday Supper too! Gather the family around the table and make memories with this delicious meal! Mince 6 cloves of garlic and 1 onion. Dice 1 bell pepper and cut 1 8 oz. package button mushrooms into small slices. Roughly chop 1 cup fresh spinach. Heat a large cast iron skillet to medium. Add 1 Tbsp. olive oil. Once the oil is heated, add the garlic and onions and saute for 2-3 minutes, stirring often. Add the sliced mushrooms along with a pinch of salt and pepper. Saute the mushrooms for 4-5 minutes, stirring often. The mushrooms will cook down quite a bit. 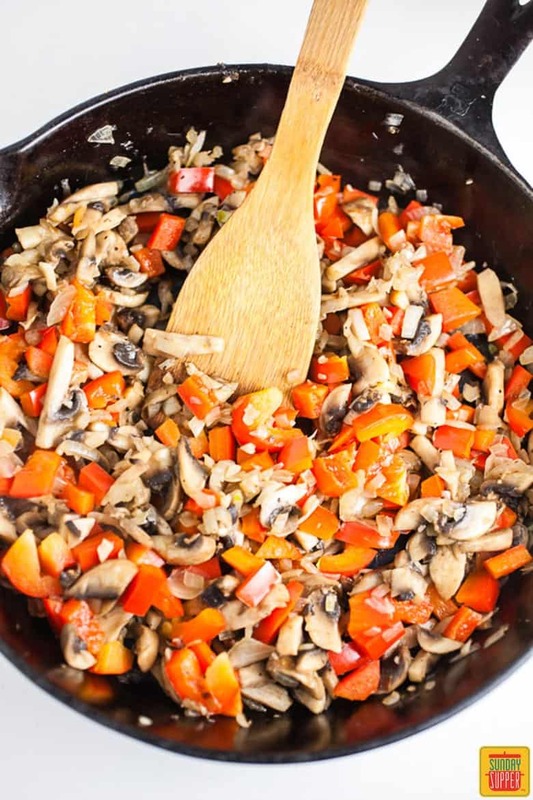 Add the diced pepper to the mushrooms and saute for an additional 3-4 minutes, stirring often. Add 1 24 oz. jar of marinara sauce and 1 1/2 cups of vegetable broth to the mushrooms and peppers. Stir to combine. Break 8-10 dry lasagna noodles into small pieces and add to the pan. Stir the noodles into the sauce. The noodles cook in the sauce so it is important that all the noodles are submerged in the liquid. Bring the sauce to a low boil and then reduce to a simmer. The sauce should bubble lightly as it cooks. The heat should be hot enough to cook the noodles but not hot enough to cause the sauce to splatter - Medium/low should work fine. Cook the noodles on a low boil for 30 minutes. Stir the noodles every 5 minutes or so (more important toward the 30 minute mark) to prevent them from sticking to the pan. Add an additional 1/2 cup of vegetable stock as the noodles cook. Once the noodles are cooked and have absorbed most of the sauce, add the cup of chopped spinach and stir into the lasagna. Spoon 1/2-3/4 cup of ricotta cheese on top of the lasagna in chunks (do not stir ricotta into lasagna) and sprinkle 1/2-3/4 cup shredded mozzarella on top of ricotta. Place the pan in the oven directly under the broiler for 2 minutes or until the cheese melts. Remove pan from oven. To serve: Sprinkle 1/4 cup Parmesan cheese, 2 tsp. red chili flakes, and 1/2 cup chopped fresh basil on top of lasagna (optional). Try to make sure the noodles do not clump together as they cook. This will prevent them from cooking evenly. The noodles should be soft but not mushy when they are done.